It’s been sometime since I’ve shared my insights with Undercover Recruiter (my recent move to Los Angeles with Recruiting Social has been a busy but exciting time). What better way to dive in again than by sharing some sourcing tips! Let’s get back to basics and learn how to improve our sourcing efficiency. *Until you’re ready to use other social platforms. The perk of using LinkedIn as your starting point? Name generation. Most of the time you can create a healthy list of candidates by using a similar LinkedIn search string. If you want to try other social channels like Twitter or Github, simply remove LinkedIn from the search string and replace it with another site of choice. You might have noticed one string included ‘site’ the other included ‘inurl’. The difference between site and inurl? (inurl searches the whole URL while site just searches in the domain). In addition, I would include ‘gmail’. This will allow me to extract emails from users’ accounts that have a gmail address visible on their Github account. We can use this email to reach out about a job opportunity, without having to use a LinkedIn Inmail. Once you’ve found your ideal candidate, here are a few resources I’ve come across that have been helpful in identifying email addresses. Before using any tool, always, always remember to check the candidates’ ‘Advice for contacting section’ OR ‘contact info’ at the top of their LinkedIn profile page (directly under the candidate’s profile picture). Some candidates will either include their blog site, Twitter account or other relevant contact information. Hiretual is a Chrome Extension that allows you to gather additional information (i.e. email addresses) from a candidate’s LinkedIn profile. An extra search method to try: Reverse Image Search. Example: Right click on the image and select Search Google for Image. Some candidates use the same image for other social media sites as their LinkedIn profile image, which provides sourcers/recruiters alternative ways to reach out on those platforms [i.e. a candidate’s Twitter account – tweet about a job opportunity]. 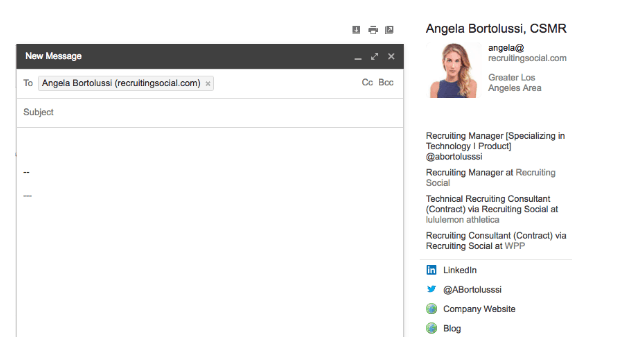 Chrome extension: Rapportive shows you everything about your contacts right inside your inbox. Open up your Gmail account and click ‘compose’ (to generate a new email). Include the candidate’s email address in the new message (ensure Rapportive is turned on). Once you’ve included the email address, view the right of your screen. Recruiters/sourcers should be able to see social information generated on the candidate (i.e. LinkedIn profile, Twitter account, ectc.) this will help provide confirmation whether the email address is associated with the candidate. You can also use Facebook to verify email addresses (not always a guaranteed method to verify). 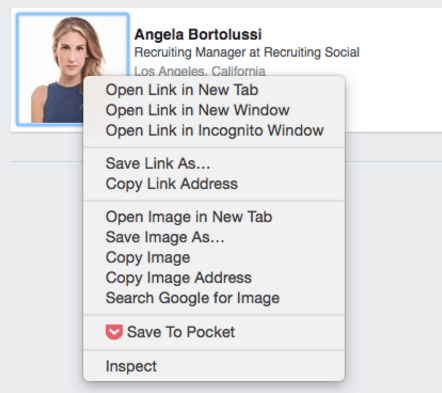 In the search bar of your Facebook homepage type in the candidate’s email address and see if you can find the candidate. Once you’ve clicked on the repository sourcers/recruiters can see how many users have contributed. You will now be able to see the contributor’s account – go ahead and click on the account. Guess what? You may come across this (yup, an email address). Hopefully these ‘back to basics’ tips will support your sourcing and recruitment efforts. Remember the fun part of souring is the research part, gathering the information (while also using some free tools to support your search)!